An average change of -1.05 feet was noted in the groundwater levels of the Ogallala/Edwards-Trinity (High Plains) Aquifer from 2018 to 2019 within the 16-county High Plains Underground Water Conservation District (HPWD). The 10-year District average change (2009-2019) is -8.83 feet while the five-year District average change (2014-2019) is -2.13 feet. 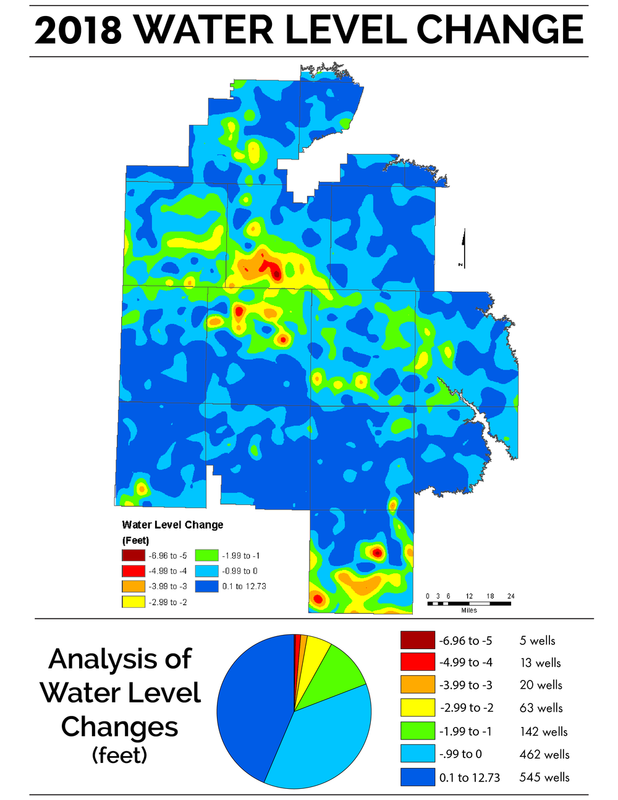 The average saturated thickness of the Ogallala/Edwards-Trinity (High Plains) Aquifer within the District is 56 feet (2018-2019). It remained unchanged from last year. 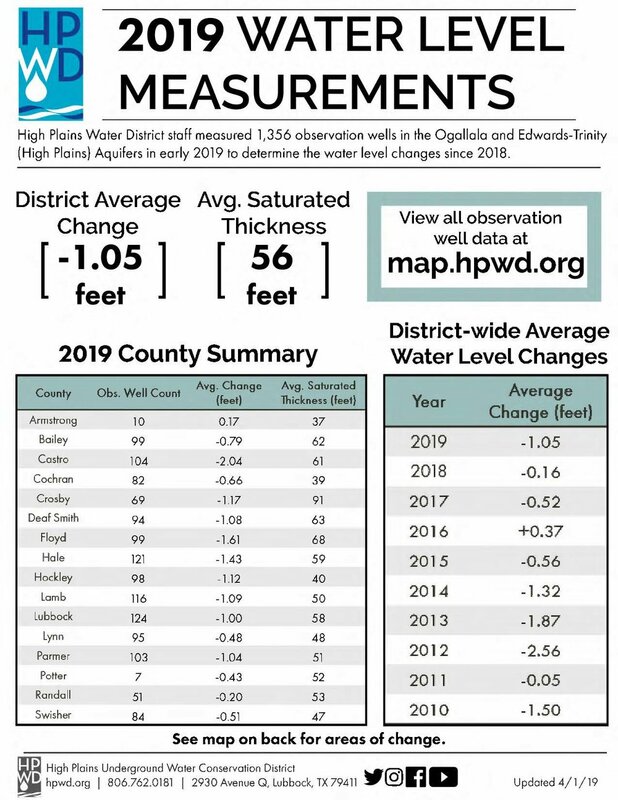 HPWD staff shared final results of the 2019 water level measurements with the District’s five-member Board of Directors at their April 9 meeting. Beginning in January, HPWD field personnel made water level measurements in a network of 1,356 privately-owned water wells completed into the Ogallala/Edwards-Trinity (High Plains) Aquifer. In addition, measurements were also made in 31 Dockum Aquifer wells. County wide average declines were recorded in 15 of the 16 counties in the District since the 2018 measurements. “This can probably be attributed to the fact that the area received about half the rainfall in 2018 as it did in 2017. A large amount of irrigation was needed up until the time that it rained toward the end of the growing season,” said HPWD Field Technician Supervisor Keith Whitworth. Whitworth shared the following statistics for observation wells with publishable measurements. 234 observation wells with increases ranging from 0.1 to 5.41 feet. 518 observation wells with decreases ranging from 0 to -.99 of a foot. 279 observation wells with decreases ranging from – 1 to -1.99 feet. 173 observation wells with decreases ranging from -2 to -2.99 feet. 58 observation wells with decreases ranging from -3 to -3.99 feet. 26 observation wells with decreases ranging from -4 to -4.99 feet. 29 observation wells with decreases ranging from -5 to -12.98 feet. “Each year, there are wells that show water level rises and others that show water level declines. The largest water level rise was 5.41 feet in a Lynn County well and the largest water level decline was -12.98 feet in a Floyd County well,” Whitworth said. “Groundwater recharge occurs quickly in Lynn County due to sandier soils and a shallow water table. The area in Floyd County where the large decline is shown takes much longer to recover from the previous irrigation season,” he said. Results of the 2019 water level measurements and updated saturated thickness information are now available on the interactive map on the HPWD website (map.hpwd.org). Those who want printed information should contact Jed Leibbrandt at (806) 762-0181 or email him at jed.leibbrandt@hpwd.org. He can provide print copies of water level measurement data for an individual county or specific counties of interest. An average change of -0.16 of a foot was noted in the groundwater levels of the Ogallala/Edwards-Trinity (High Plains) Aquifer from 2017 to 2018 within the 16-county High Plains Underground Water Conservation District (HPWD) service area. The 10-year District average change (2008-2018) is -8.76 feet while the five-year district average change (2013-2018) is -2.07 feet. The average saturated thickness of the Ogallala Aquifer within the District is about 56 feet (2017-2018). HPWD staff shared this information with the District’s five-member Board of Directors during their April 10 regular monthly meeting. In early 2018, HPWD field personnel made annual water level measurements in a network of 1,353 privately-owned water wells completed into the Ogallala/Edwards-Trinity (High Plains) Aquifers. In addition, water level measurements were also made in 33 Dockum Aquifer wells. Since the 2017 measurements, there are nine counties with an average increase in water levels and seven counties with an average decrease. Field Technician Supervisor Keith Whitworth shared statistics for the 1,250 observation wells with publishable measurements. He noted that about 40 percent of the observation wells measured in 2018 had water level increases. 545 observation wells with increases ranging from 0.1 to 12.73 feet. 462 observation wells with decreases ranging from 0 to -.99 of a foot. 142 observation wells with decreases ranging from -1 to -1.99 feet. 63 observation wells with decreases ranging from -2 to -2.99 feet. 13 observation wells with decreases ranging from -4 to -4.99 feet. 5 observation wells with decreases ranging from -5 to -6.96 feet. “Each year, there are wells that show water level rises and others that show water level decreases. The largest water level rise was 12.73 feet in a Lubbock County well while the largest water level decline was -6.96 feet in a Castro County well,” said Whitworth. Updated water level data is now available to the public at map.hpwd.org. “Since 2013, the number of persons using the interactive map for depth-to-water and saturated thickness information has increased significantly. Because of this, HPWD is discontinuing its printed water level report starting this year,” said Jason Coleman, General Manager. He added that moving to an online data platform eliminates the cost of printing and mailing the previous 84-page report, which saves taxpayer money. Those who would like printed information should contact Jed Leibbrandt at (806) 762-0181 or email him at jed.leibbrandt@hpwd.org. He can provide hard copies of water level measurement data for an individual county or specific counties of interest. Download the 2018 Water Level Measurement infographic here. This map depicts the 2018 water level measurement changes throughout the high plains water district.